For most people, music is part of their lives. What could be more amazing than carrying your favorite music with you? Bluetooth boomboxes make music portable. They’re generally lightweight, operate wirelessly, and come with a battery pack. With these speakers, you’ll not have to connect any wires. You’ll simply stream your music from a Bluetooth device to a Bluetooth enabled boombox. Moreover, the best Bluetooth boomboxes are rechargeable such that you can use them without connecting to the mains power, thereby enhancing their portability. Thus, a boombox with Bluetooth functionality is something that every music lover should have. However, how would you know the best boombox to choose? It can be quite confusing when choosing the best type to buy since there’re many types of boomboxes with Bluetooth support in the market today. Luckily, we have prepared this review and buying guide to make it easier for you to choose the best type. Thus, read on through this article for a review and buying guide on the best Bluetooth boomboxes. Many individuals always come to us with questions regarding the kind of Bluetooth boomboxes they should buy.Some come to us with reports of having terrible experiences with some options while others don’t know where to start when choosing one. Thus, we decided to write this review to assist everyone out there who has plans of investing in a boombox with Bluetooth. Our aim is to assist you in making a better choice. Therefore, we have reviewed existing research on Bluetooth ready boomboxes and interviewed users who already own them. We also took data from experts dealing with Bluetooth speakers and boomboxes. We analyzed the data we gathered and this enabled us to know the top features that these boomboxes should have. This way, we were able to shortlist the best boomboxes with Bluetooth. JBL Flip 4 is an all-weather Bluetooth boombox that can be used just anywhere. It boasts of being unique in that it’s waterproof. Thus, you can use it in any environment, including when fishing or boat riding. With this speaker, you’ll never have to worry about the weather condition out there. Connecting up to two devices- JBL Flip 4 allows you to easily connect two Bluetooth enabled devices of your choice. You can connect two smartphones, tablets, or any other portable Bluetooth devices to stream your music wirelessly with impressive stereo audio. Rechargeable 3000 mAh battery- This boombox has a rechargeable battery with a capacity of up to 3000 mAh and can support up to 12hrs of playing music. Thus, with this boombox speaker, you will never worry about it getting drained fast since you’ll have many hours of enjoying your music. Waterproof- It’s worth noting that this boombox speaker is specially made to be waterproof and you can actually submerge it in water without any damage. You’ll never have to worry about the weather condition out there since water cannot spill inside and you can even use it in a spa, boat or out in the rain. Bass radiator- The speaker comes with a specially made JBL bass radiator for enhanced bass effects. Despite the small, compact design of the speaker, you’ll still experience quality bass from its passive bass radiators. Inbuilt echo and noise elimination- This speaker boasts of having inbuilt echo and noise elimination mechanisms. Thus, you’ll have a great listening experience without issues of echo and noise especially when listening to conference calls. Our Verdict: In case you are searching for a small size, portable boombox speaker with deep bass, then you may want to add the JBL Flip 4 in your shopping list. Moreover, it’s very affordable, thus ideal for anyone with a tight budget. The Aiwa Exos-9 boombox with Bluetooth functionality is specially designed for clarity and power. It’s made of high quality components for unmatched performance, and that’s why you’re guaranteed of investing in a quality product. Thus, it’s designed to satisfy the music needs of a user without worries on its performance and durability. Five speaker drivers- This speaker boasts of having five powered speaker drivers, including a 6.5 inches subwoofer with dual voice coils. Thus, the speaker delivers loud and quality sound with deep, punchy bass regardless of the volume level. Removable battery- The Aiwa Exos-9 comes with removable and rechargeable battery pack, making it more portable and easy to charge. You can use the boombox in areas without a power outlet such as the beach, camping site, boat or any other outdoor area. Onboard equalizer- What could be greater than a Bluetooth speaker that comes with an onboard five-band equalizer? This speaker features a graphic equalizer with four pre-sets and customizable fine tuning capabilities. Lockable and secure Bluetooth- This boombox Bluetooth speaker comes with a secure Bluetooth functionality that you can lock as needed. Thus, you can control who can connect to the Boombox and you can also choose when to share the connection with another device. Supports NFC and Aux- Besides connecting your devices with Bluetooth, you can also connect devices wirelessly via Android NFC or use a 3.5mm Aux cable to connect your device. Thus, you’ll have the freedom to connect a device using the technique that suits your needs. Our Verdict: Anyone looking for a high-quality Bluetooth speaker with loud sound, punchy bass and fast Bluetooth connectivity should go for this speaker. Despite being a little more expensive, it’s worth its quality and unmatched features. This Bluetooth speaker is designed with the needs of customers in mind. Therefore, it’s designed to transform how people enjoy music by delivering quality music regardless of the location, be it indoors or outdoors. It’s durable and rugged design makes it suitable for use even in the most harsh environments and weather. Full water resistance- While some speakers may only resist small water splashes, the AIMOS Bluetooth boombox can be submerged in water for a depth of up to 33ft for half an hour. Thus, you can use it in any wet environment including your bathroom, the beach, swimming pool, spa or any other such areas without worries of getting damaged by water. Rich sound- This speaker delivers clear and rich sound both indoors and outdoors. You’ll enjoy music with all details regardless of the genre or loudness and you can also use it to make clear hand-free calls. Super booming bass- The speaker comes with two 30 watts speakers and two passive bass radiators. The radiators enhance bass despite its small size, thereby enhancing your listening experience. Fast charging mechanism- What could be better than a fast-charging portable speaker? It’s worth noting that the AIMOS speaker comes with fast-charging mechanism to allow you charge the battery full in just 3 hours at most. You may use it as a power bank- The battery pack that comes with this speaker can also charge your devices. You can charge your smartphone using this speaker via USB, thus you’ll never worry about draining your device when streaming music via Bluetooth. Our Verdict: In case you enjoy listening to music in a wet environment such as the beach, shower area or spa, then you’ll surely appreciate the full waterproof nature of this speaker. Moreover, it’s quite affordable. The SONY GTKXB7BC is a unique Bluetooth speaker with club-like LED lights. It’s designed to create a party-like environment, thereby making it ideal to use in night parties for a great partying experience. It’s also ideal for any other night gathering where quality music and bass are a top priority. EXTRA BASS function- This boombox comes with EXTRA BASS functionality to match with today’s music that often has heavy beats. This technology delivers high-quality, deep, and powerful bass unlike in other portable boomboxes. LED lighting- You’ll be amazed by the LED lighting that comes with this speaker, featuring multicolor lighting patterns. The LED lighting illuminates the surroundings in accordance to the rhythm of the playing beats, thereby creating a party-like environment. Two-way placement- You can choose to place the space horizontally for a more classic set up or place it standing upright if you have limited space. This way, you’ll never worry about how you place it depending on your preference. Easy to connect with other devices- You can hook up the speaker to any audio or video device since it comes with an audio input and output. Thus, you’ll never be limited in using the speaker via Bluetooth alone since you can also hook it up with your TV or other devices with AUX. USB port- Besides connecting other devices via Bluetooth and AUX, you can also plug USB devices such as a flash disk or USB card reader. Its support for plug and play via USB gives you the freedom to play music from devices that lack Bluetooth connectivity but have a USB port. Our Verdict: The SONY GTKXB7BC is a great boombox with Bluetooth support for anyone who likes partying and clubbing. It’s LED lighting effects create a party-like environment for party lovers. Even though it’s a little more expensive, keep its high quality in mind. Pyle PBMSPG190 stands out from other speakers for it is specially designed for the outdoor environment. It has a sturdy housing that makes it strong enough to use outdoors for activities such a street performances and outdoor parties. The casing protects the interior components from damage in case it falls or an object hits it. Inputs for microphone and guitar- The boombox comes with one input for a microphone and one input for a guitar. This makes the speaker ideal for street performers as they make performances with their guitar or microphone. Durable exterior housing- Pyle PBMSPG190 boasts of having an extremely durable and sturdy housing. The housing protects the speaker against the harsh outdoor environment. Comes with a subwoofer and two speakers- This Bluetooth enabled boombox comes with a 6.5 inches subwoofer and two speakers each measuring 2.5 inches. This allows you to enjoy high and low notes with incredible bass, thereby making it possible to hear all details in audio. Detachable belt- One notable unique feature and benefit that comes with this speaker is its detachable belt for carrying the speaker. This enhances its portability since you can simply hook the belt when carrying it and unhook it when listening to music. Digital screen display- The speaker has a digital screen that displays details in a digital format. With this display, you can easily view more details about the currently playing track for easier control. Our Verdict: If you are a street performer looking for a portable, Bluetooth enabled speaker, you should surely add Pyle PBMSPG190 in your shortlist. It’s also ideal for anyone who wants to connect a microphone or guitar. JBL Boombox Portable is specially designed for portability. It comes with a rechargeable battery with a capacity of 20,000 mAh. You can carry it and use it anywhere without the need to charge it for several hours, thereby giving you a chance to enjoy your music for many hours in a single full charge. Dual charge power bank- Besides powering the speaker, the inbuilt high-capacity battery also makes the speaker a power bank. It has dual USB charging ports to charge your mobile devices like smartphones and tablets. Features powerful transducers and bass radiators- The speaker comes with 2 dedicated bass radiators and 4 transducers. They work to deliver great sound with hard hitting bass regardless of the music genre or volume. Weatherproof and rugged design- JBL Boombox Portable has a rigged design to handle any wild tailgate parties. Moreover, its waterproof nature makes it weatherproof such that it can be used in any weather and pool parties. High capacity battery- This boombox boasts of having a high-capacity and rechargeable battery. The 20,000 mAh battery can hold charge for several hours of playing loud music. Amazingly designed carrier handle- The carrier handle that comes with this speaker is designed to make the speaker more portable. You can carry it easily by the handle and you can also enjoy your music while carrying it around. Our Verdict: JBL Boombox Portable stands out for portability. Its handle makes it easy to carry around and its high-capacity and rechargeable battery makes it usable for several hours with a single charge. Although it’s a little bit expensive, you’ll surely appreciate its quality. Shock absorbing casing- The casing is specially built to absorb shock. Thus, you may use it for rough activities such as parties and it can sustain light falls without getting damaged. Amplifies all audio frequencies- Unlike ordinary boomboxes, Photive M90 amplifies even the lowest and highest audio frequencies. This way, you’ll enjoy a great sound experience including bass. Extended battery life- The speaker comes with a 5000 mAh rechargeable battery for many hours of use. You can use it for 8 to 10 hours while playing heavy bass and loud volume. Rubberized handle- The carrier handle that comes with this speaker is sturdy and rubberized. It makes it easier to carry for active music lovers. Aluminum grill- The speaker is protected by a rugged and tough aluminum grill. The grill protects the interior components from damage. Our Verdict: Anyone searching for an affordable, yet functional boombox with Bluetooth functionality should consider Photive M90. Moreover, it’s loud enough but the lows fade a little bit at higher volume. G-Boom boasts of being a sturdy Bluetooth boombox speaker. It has a rugged housing that keeps it protected and has a well-designed base that reduces chances of falling over. Thus, it is designed for strength and stability. Despite not being very attractive, it’ll surely serve you for many years due to its durability. Rugged grip- The carrying handle of this speaker is strong, rugged and reinforced. This offers a better grip to carry the speaker safely with minimum chances of sliding off. Rubberized base- The base of the speaker is rubberized and rugged. As such, it offers a firm base for standing the speaker with minimal chances of sliding. Equalizer- The speaker comes with equalizer settings with presets. The preset options in the equalizer allows you to set full, extra or bright bass. Aux input- Besides offering an option to connect devices via Bluetooth, the speaker also offers an AUX input to connect devices. Thus, you can easily connect your mobile device using a 3.5mm output into the speaker’s AUX input. Onboard controls- What could be better than a boombox that comes with onboard control buttons? You can skip, play or pause tracks wirelessly by pressing the onboard controls on this speaker. Our Verdict: G-Project G-Boom might not be built for aesthetics, but it’s surely designed for strength and durability. Overall, it offers a strong grip and good sound quality that you’ll appreciate. Now that you have opted to go wireless, you should know exactly what you want from the Bluetooth boombox, besides Bluetooth functionality. There’re some important features you’ll need to factor in your choice to stand a better chance of getting the best value for your hard-earned money. Here’re the things you need to consider before buying a Bluetooth ready boombox. When shopping for a wireless boombox, you will need to consider its weight. If you plan to carry it with you often, then you should consider going for a lightweight boombox. Also, it should come with a carrier handle for easier carrying when moving around especially when it weighs more than average. However, an extremely light boombox may not really have the best battery pack and speakers. Thus, if you’re intending to use it indoors without much movement, then weight will not be a major issue. Therefore, portability will depend on the intended use. Most boomboxes are powered by AC and/or a rechargeable battery or non-rechargeable batteries. In case you’ll be using the boombox outdoors, then ensure it comes with a durable battery pack. If the battery pack is rechargeable, then it will be better for you. The battery capacity should be large enough especially if you’ll be using it outdoors for several hours. The last thing you’ll want is spending your money on a Bluetooth ready boombox that will break down sooner. You’ll want to purchase a unit that will surely serve you for many years without breaking down. Thus, consider choosing a boombox that is made of high-quality materials. The housing should also be strong enough to keep it protected. It’s important to ensure the boombox you’re about to buy is compatible with the devices you’ll want to use. For instance, it should be compatible with the operating system of your device. If the boombox supports pairing with multiple operating systems such as Android, iOS and Windows, the better. Thus, the best boombox should pair with an iPhone, Android Smartphone, Windows PC or iOS PC. Besides the boombox speaker coming with support for Bluetooth connectivity, it’s great to go for a speaker with other connectivity options. For example, it’ll be better going for a boombox that also supports wired connectivity. If it comes with an AUX input, you will easily connect your device with a 3.5mm to AUX speaker cable. Support for NFC will be an extra benefit since it’ll make it easier to connect devices quickly. Also, a USB port will be an added advantage to assist with connecting USB devices such as USB memory card adapters and flash disks for music playback. The last thing you’d want is your mobile device running out of charge when streaming music via Bluetooth and you’re not anywhere near a power source. Thus, it’s essential to go for a Bluetooth boombox that also works as a power bank. This way, you can charge your smartphone or tablet with the speaker while streaming music. There’re dozens of Bluetooth boomboxes to choose from in the market today. However, not all boomboxes are built the same. Some offer greater features than others, while others are more durable than others. 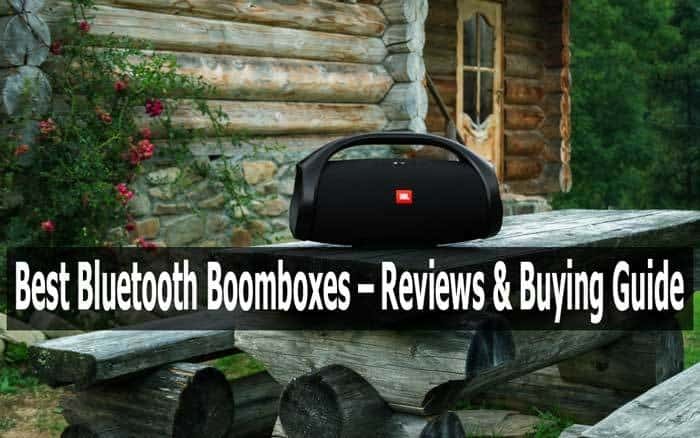 Luckily, with this review, you’ll be assured of only choosing between the best Bluetooth boomboxes you can ever find out there. Although the boomboxes reviewed here come with multiple features and benefits, they also come with their own share of shortcomings. When making a choice, ensure you can manage to cope with the shortcomings of the boombox speaker. However, avoid compromising on the quality over cost. While your budget will surely determine the boombox you’ll buy, ensure it’s of high quality and offers the features you need. By investing in a high-quality Bluetooth boombox, you’ll surely enjoy streaming your music wirelessly. You’ll also carry your music with you especially when you go for a portable boombox.